Anthony Perkins delves into the darkest depths of human nature as the host of Chillers, a deliciously evil anthology series based on Patricia Highsmith’s hair-raising short stories. This 2-disc release is housed in a standard DVD case. No features were included however there is a code for the Digital Copy, redeemable only on Mill Creek’s site. Chillers is shown with a Full Frame 1.33 aspect ratio as it was originally shown on TV and comes with a standard Dolby Digital 2.0 track, outputting decent dialogue levels. 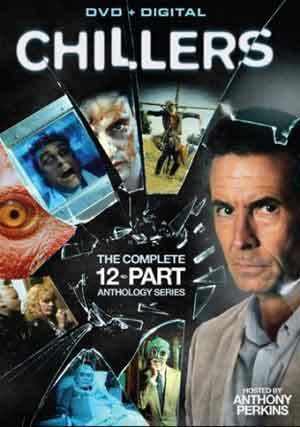 Overall, Chillers is a fun version TV safe version of Tales from the Crypt or The Twilight Zone and having the legendary Anthony Perkins hosting was perfect. This DVD release offers up so-so video/audio transfers and no bonus material.